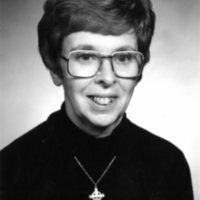 Listen as Joan Frances Crowley, BVM, Assistant Dean in Residency, and History Instructor at Mundelein College, recounts how participation in the Freedom March of 1965 caused controversy within the student body. 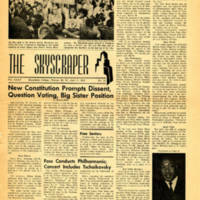 Special edition of the Skyscraper, April 7, 1965, focusing on the Selma March. 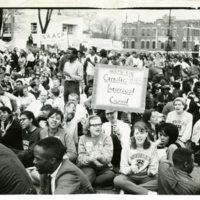 Mundelein Students at the Selma March, 1965. 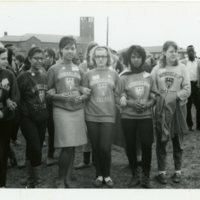 The Mundelein students who attended the Selma March, 1965. 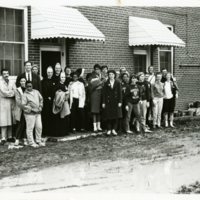 Mundelein Catholic Interracial Council students at the Selma March, 1965. By 1965, many Mundelein students were more interested in direct action that mere dialogue. Twenty-eight undergraduates joined the Freedom March—a 5-day trek from Selma to Montgomery, Alabama led by Martin Luther King Jr.—to take a stand against Southern racism and segregation.